The Group of 184 (Groupe 184), although now defunct, had been the Haitian public voice as well as it was the best salesperson for Haiti. 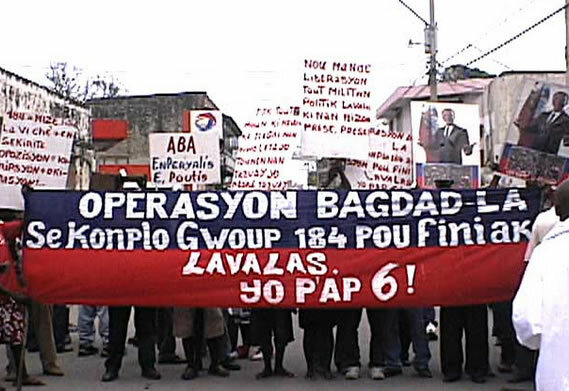 It was the most powerful coalition of "civil society" organizations during the lead up to the 2004 coup that successfully destabilized Haiti's elected government and deposed President Aristide. It consisted both individuals and organizations, arranged in thirteen sectors like cultural, urban neighborhood, private enterprise, labor and peasant unions, feminist, media, human rights, non-governmental organization, etc.,. They had an agenda against the largest corporations in Haiti--the owners of such corporations constituted less than 1% of the population but owned over 50% of the country's wealth.